All transactions are safe and secure with a reliable history in online purchasing behind each of our associates. 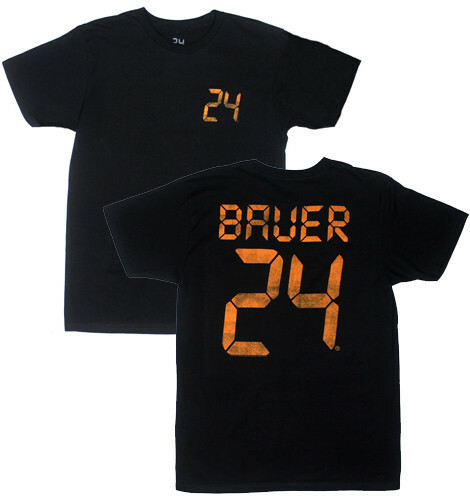 Buy the Bauer 24 Player t-shirt to own 24 clothing and merchandise. The time is now to get one of these Jack Bauer 24 t-shirts that display the name and number of CTU agent Jack Bauer. The player style 24 jersey design features digital style font, identical to the TV show logo. Support Team Bauer, including analyst Chloe O'Brian. He may get things done the hard way, but he certainly understands how the game is played. Counter terrorism and wear this tee to show that you believe in Bauer, even if he is only one man. In addition to the Bauer 24 Player tee above, browse the 24 Clothing Gallery for more apparel like men's and women's clothes, kids shirts or hoodies.